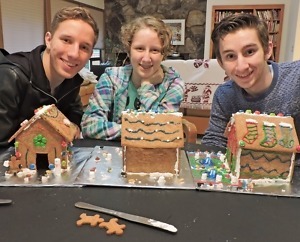 My husband, Dean, has made gingerbread houses for the grandkids to decorate since they were very small (the oldest just turned 20). They were pleased that he was able to continue the tradition this year despite his recent hospital stay. I made hot chocolate for the kids but Dean doesn’t like hot drinks, so I made eggnog for him. I don’t know why I didn’t think of that sooner! I haven’t been able to persuade him to join me in my morning regimen of Butter Coffee with MCT Oil and I’ve been looking for an alternative delivery system for the good, natural fats he needs, especially now. One advantage of eggnog over my coffee is that it doesn’t need to be frothed in a blender. Egg yolk, nature’s perfect emulsifier, makes it thick and rich after just a few seconds of whisking. My recipe calls for a raw or pasteurized egg yolk. I don’t normally worry about getting salmonella from raw eggs; the odds are very, very low, and seldom life-threatening for healthy people, however I’m being extra careful while Dean is still healing. (How ironic it would be to succumb to food poisoning after surviving almost unscathed from a major cardiac arrest!) The solution is to use pasteurized eggs that have been heated just enough to kill the bacteria but not enough to cook the egg. They are usually available in stores from Davidson’s Safest Choice Eggs: http://www.safeeggs.com/. I couldn’t find any at a local store, so I looked up ways to sterilize them myself and discovered that the most reliable way is to use a sous-vide machine. I happen to have one that has been sitting in my pantry since I got it for Christmas a few years ago. Sous-vide is a method of cooking foods in a precisely controlled water bath. According to Wikipedia, you set the eggs out until they reach room temperate, submerge them in the preheated water bath, and hold them at 135° F for 75 minutes. Since I wanted to have eggnog too, even though I’m now allergic to chicken eggs, I put some quail eggs in the water bath along with the chicken eggs. I expected it to take several tries to get the timing right for the tiny eggs, but to my surprise, all the eggs were perfect, with slightly thickened whites and liquid yolks. 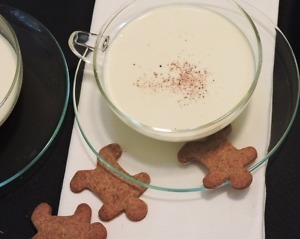 We normally think eggnog is only for Christmas and New Year’s Eve, but this recipe is destined to become a year-round favorite at my house! A wonderful cold beverage, full of good fats! No cooking required. Whisk egg yolk until smooth. Whisk in cream, low-carb milk, sweetener, vanilla, MCT oil, brandy or rum, if using, and salt. Pour into cup(s), garnish with whipped cream if desired, and sprinkle with nutmeg. Recipe makes 1 serving of about 9 ounces or 2 servings of 4½ ounces. Optional items and sweetener are not included in counts. *Many people can’t tolerate dairy products. Some react badly to lactose (milk sugar), others to the proteins in milk, especially casein. I have discovered that I am allergic to the milk from type A-1 cows but seem to be fine with A-2 animals, such as goats, sheep, water buffalo, and camels. Older breeds of cows also produce milk with A-2 proteins, however, most milk comes from type A-1 cows because they produce much more milk and offer an economic advantage. Disclaimer: I am not affiliated with any company and have not received free products. 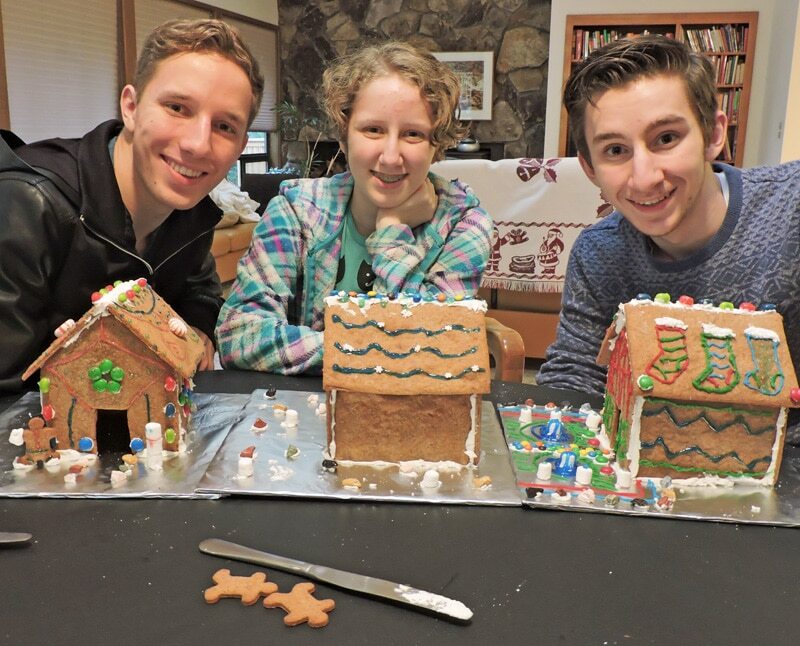 Allergies, Brain Octane Oil, Christmas traditions, Dairy, Egg safety, Eggnog, Gingerbread houses, Pasteurized eggs. Bookmark.